Am I required to use a key lockbox? It is completely optional but highly recommended for any MLS listing. Any MLS listing in the MLS, no matter what company listed it, will see fewer showings without a lockbox. Agents are reluctant to show homes without lockbox access because they know that no lockbox makes it much more difficult to persuade the buyer to buy the home. What is the advantage of using a key lockbox? The key lockbox enables the environment most likely to result in an offer; the buyer and their agent walking through the property undistracted and unhurried. The buyers don’t feel like they are imposing upon the seller’s time. They can freely talk about what they like and dislike with their spouse/friend and agent. The agent can respond to that feedback without fear of offending the seller or starting an argument. The buyer is comfortable, doesn’t feel like someone is waiting to get their house back, and can freely imagine living in the home. They haven’t been distracted by meeting a stranger, wondering if they should make small talk with the seller, or been bowled over with a sales pitch from a stranger(the seller). The agent can focus on selling the home. Can agents show my home any time they want if I use a key lockbox? No. You still must individually approve each showing. If you prefer that agents be able to show the home without contacting you we let the agents know that as well. How do agents gain access to the key lockbox? Each agent has their own secure password protected electronic key to gain safe access to the key inside the lockbox. These industry procedures for using a key lockbox have been in place for 30+ years. These procedures are time-tested and are the reason that problems with key lockboxes are virtually unheard of. What if I will be home during the showing anyway because I have children, pets, etc? The home is more likely to sell if you are not there. If the buyer sees you, even as you are leaving, they instinctively hurry through the home. There is nothing you can do or say to keep them from this behavior. Take the children and/or pets for a walk, to the mall, or a park. This may seem inconvenient, but it maximizes the opportunity to get an offer. If you insist upon being there, realize that this is less than ideal. This is not advice specifically for our customers, it applies to anyone selling their home through the MLS. We suggest you have a lockbox so that if a showing happens to be requested when you won’t be at home, you don’t need to be there. Why don’t other companies offer lockboxes with their MLS listings? Some people are uncomfortable with the idea of a key lockbox until they learn the facts. Other companies don’t bother to tell home sellers how much it hurts you to not have a key lockbox. Unfortunately, their customers find out the hard way. Yes, they are built like padlocks and are extremely tough. They are probably stronger than your door or anything else you would attach them to. The MLS (Multiple Listing Service) is owned/controlled/operated by the local association of Realtors. This is the same MLS to which all area Realtors belong. To input listings, you must be a licensed member of the Lubbock Association of Realtors (we are). MLS members cooperate by showing and selling the homes listed by other members, for which they receive a commission for bringing the buyer to the seller. The commission amount offered to the agent who brings the buyer is always listed (required by the MLS) along with the detailed information about the home and picture(s). The MLS is the primary tool agents use to find a property when they have a buyer. Over 80% of buyers use agents to help them find properties (especially the most motivated buyers: relocations, preapproved, etc.). For most agents, the MLS is the tool used everyday to find a home for their buyers (for many agents, it is the only tool they use to find homes). The MLS is not available to the public, only MLS members can view the MLS listings. In recent years, most MLS systems have distributed some listing information to websites like Realtor.com and allowed MLS members to show some listing information on their own websites. Our service enables you to get the best of both worlds: get MLS exposure to buyers and pay a commission only if you accept an offer from a buyer involved with an agent. Sell the house yourself if you choose, and PAY NO BUYER AGENT COMMISSION. You have the freedom to do as you please. All buyers and agents with buyers would be instructed to contact us directly, leaving you the time to do what you need to do in your everyday life. Will agents with buyers boycott my listing because I am saving so much money? No. Agents want to find a home that meets their buyers needs as quickly as possible, as long as they get paid a competitive commission for bringing the buyer. It is extremely rare that an agent would refuse to show a home that pays them a competitive commission and meets their buyers needs. There may be a very small number of agents that violate the Code of Ethics and Federal law prohibiting a boycott, but it is also rare. The MLS listing DOES NOT TELL THEM HOW MUCH YOU ARE PAYING TO LIST YOUR HOME, only what you are offering to pay the agent who brings the buyer, so the agent won’t know how much you are saving! It is common for an agent who hopes to list your home themselves to say that agents won’t show your home to their buyers. While making this statement violates Federal Law and the Realtor Code of Ethics, realize that this is an attempt to list your home because the agent doesn’t have a good reason why you should pay their higher price. Agents have the buyers and will work hard to earn a commission. Almost 90% of all transactions involve agents. 70% to 90% of the transactions involve a “Buyer’s Agent”; therefore, it’s of little importance who lists your property. To encourage any agent to bring you a buyer, you should offer no less than a 3% commission to the buyer’s agent. The seller customarily pays the commission even if the agent represents the buyer and not the seller. 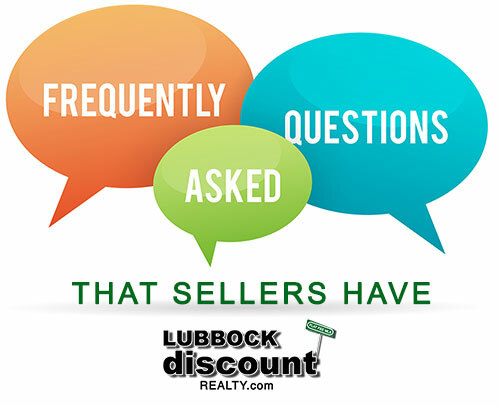 When you list your property with Lubbock Discount Realty, there is no “listing” commission. The commission that you agree to pay in the listing agreement is paid to the agent who produces a contract on which you close, and is the amount of the commission offered in the MLS. What if I sell the house by myself? If you find your own buyer, NO COMMISSION IS DUE! It’s your property. If you want to advertise the property elsewhere, or want your own “For Sale By Owner” signs, there are no restrictions, although we think it is ill advised to place a “For Sale By Owner” sign at the property next to another sign. Call the office for further explanation. Again, if there is no agent involved, there is NO COMMISSION DUE! We here at Lubbock Discount Realty have financing available through our partner Mortgage Companies. Of course buyers can get financing anywhere they wish. Today, most buyers get preapproved for a mortgage before they begin to look at homes, especially buyers that work with agents who often make that a requirement before homes are viewed. The buyer should present a preapproval letter on the letterhead of a mortgage lender and signed by a loan officer. Requiring a pre-approval letter keeps you as the seller from having to determine whether the buyer will qualify for a loan and makes the process much simpler. Closing costs are an accumulation of charges paid to different entities associated with the buying and selling of real estate. For sellers, they are usually about 1% – 2% of the total sales price of a property(not including real estate commissions). Some of the closing costs you might encounter are: escrow fee, documentation fee, homeowners’ association fees, pest/rot inspection, and title insurance premium.